The TITAN is a discharge system designed for discharging wedge hoppers and other large hoppers that have long, narrow discharge openings with high material head loads, typically found in railcar and truck dump stations. Compaction is a common problem when using belt or apron feeders due to their inherently poor design for this application. Unlike belt or apron feeders, the material is discharged from the front to the back so only free flowing material is being moved. Therefore, compaction of the static material in the hopper is avoided. 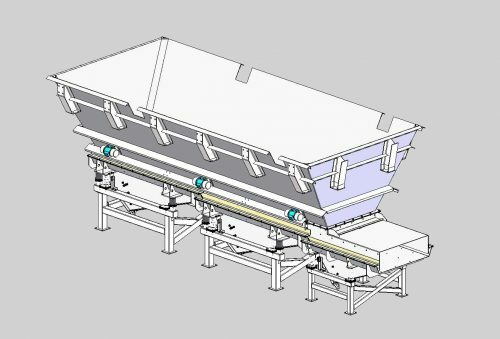 Less Wear and Maintenance – The low average system duty and distributed utilization of the multiple vibratory feeders (which have inherently low maintenance in themselves) offer substantial reduction in maintenance costs and downtime in comparison to belt and apron feeders. Low Energy Consumption – Because the whole feeding unit is not always in operation at the same time – each feeder works independently – the power requirements diminish when compared to belt and apron feeders. Minimal Vertical Head Room – The TITAN system has small work-space requirements, allowing for long slotted narrow hoppers to be designed in work envelopes where it might otherwise not be possible to consider belt feeders or apron feeders. High Storage Capacities – By incorporating long slotted hoppers and the TITAN by JVI, a plant can store maximum material volume in smaller work envelopes at reduced installation costs. JVI’s Titan System can reduce pit depth requirements, stack up heights, and excavation costs. The Titan’s series of cascading feeders handles dissimilar materials seamlessly while eliminating material compaction and maintenance issues.